Call of Duty: Modern Warfare 2's single-player-campaign called "For the Record" begins five years after the events in Call of Duty 4: Modern Warfare. The world is once again at the brink of destruction. The Russians, originally defeated by the Americans, make Zhakaev a hero and threaten once again the peace on earth. Worse: they get help by a known terrorist who tries everything to let escalate the tension into a full-scale-war. In the middle: the player. During his missions he will slip into the shoes of PFC. Joseph Allen, Sgt. Gary "Roach" Sanderson who is a member of Task-Force 141 and the hero of the first game, Captain "Soap" McTavish – leader of said task-force. 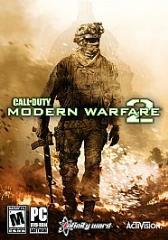 As its predecessor, Call of Duty: Modern Warfare 2 is a first-person-shooter that provides a fairly linear but heavily scripted and action-oriented single-player-experience. The missions take the player all over the world shooting, sneaking and driving through enemy lines to fulfill his various objectives like blowing up a fueling station. To fight all those hordes of ever respawning enemies, he has access to a large collection of modern-world-weaponry but can only carry two weapons plus grenades at a time. This is also true for the multiplayer-mode of the game which again features an extensive ranking system with the players gaining experience points for killing enemies, winning a round or completing objectives. Once enough experience points have been collected, the player advances in rank and unlocks new game-modes (ranging from deathmatch to pure team-oriented modes), new dog-tags and new weapons and abilities with which he can create his own custom class besides the five standard classes available. Also available is a coop-game-mode for two players called "Spec Ops" featuring several missions going on besides the main campaign in three different difficulty-settings with several different objectives including getting from A to B in a certain amount of time. These missions can also be completed alone however.